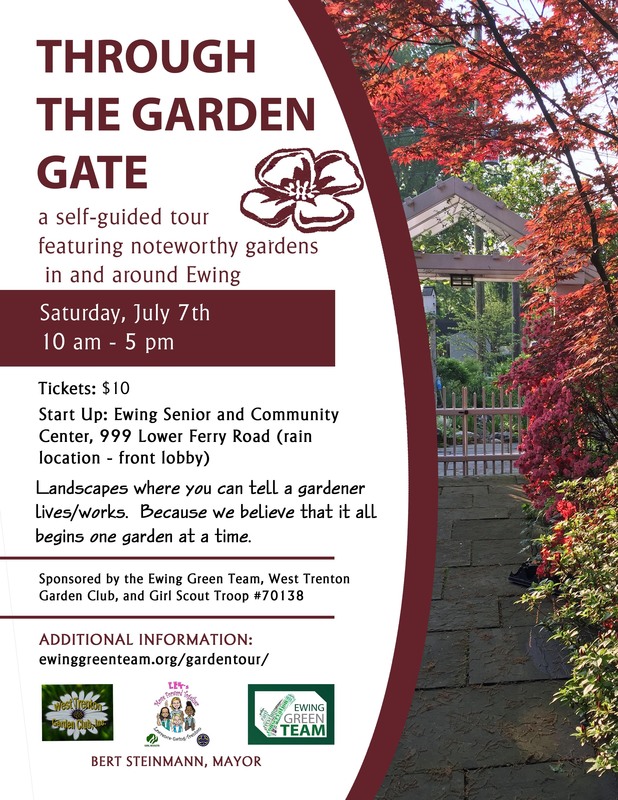 The Ewing Green Team, the West Trenton Garden Club and local Girl Scout Troop #70138 are excited to invite you to our 2018 Through the Garden Gate Tour of Ewing and its environs! This year we will showcase a number of new gardens and highlight improvements to some of the gardens from prior years. Most of our gardens follow sustainable landscaping practices and a few are even National Wildlife Federation and North American Butterfly Association certified. Following previous tours in June and in September, our tour this year in early July will give the gardeners a chance to show off their gardens in at the height of the gardening season! This fourth garden tour of Ewing is being held to promote our mutual causes of beautification, sustainability, and youth development. It is our belief that showcasing some of Ewing’s noteworthy gardens is a great way to help us engage more people in beautifying our town. A beautiful town elicits pride among its residents and helps to build community. We believe that it can all begin with one garden at a time. The 2018 Through the Garden Gate Tour will be a self-guided ticketed event, featuring gardens throughout Ewing, with a couple of stand-out gardens from neighboring towns. The tour date is set for Saturday, July 7th with a rain date of July 8th. Gardens will be open from 10 am – 5 pm.